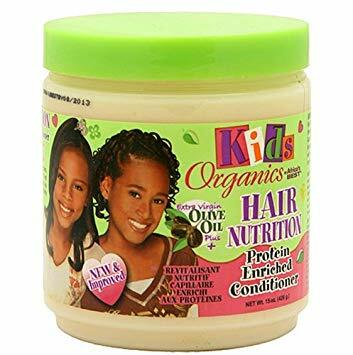 Africa's Best Kids Organics Hair Nutrition Protein Enriched Conditioner with Extra Virgin Olive Oil and a natural botanical blend of herbal extracts, vitamins and proteins, Kids Hair Nutrition Protein Enriched Conditioner moisturizes and strengthens weak, damaged or overprocessed hair. With regular use, fragile hair becomes rejuvenated and renewed. Leaves hair healthy looking, shiny and with improved elasticity. Apply to clean hair. Leave-on for 5 minutes or more. Rinse. For deeper conditioning: Cover hair with plastic cap and sit under a warm dryer for 10 minutes or more.